So, I booked a trip to Disney World on a whim last week... Why not, ey?! My brother has been to Orlando recently and I've got a former cast member colleague so I'll be asking them for lots of Disney World advice but I have started to put my own little plan together and I'm slightly overwhelmed, there's so much to think about! The adverts make it look like you will be skipping around the parks hand in hand with Mikey and waltzing up to attractions and walking straight on but previous experience tells me otherwise. To make sure I have plenty of fun and enjoy both the build-up and the holiday I've broken my planning down into smaller, more manageable chunks. I would like to have a rough idea of which park we are heading to each day so I can make some dining reservations and book our FastPasses (more on this later.) I don't want to have every minute accounted for and plan on having plenty of downtime. We will be in Orlando for just under two weeks so a few days at the water parks, relaxing in the hotel pool and a few cocktails in DisneySprings will be a welcome break after walking 30k+ steps in the parks. I've got a notebook and a folder for all my tickets, this girl is organised! 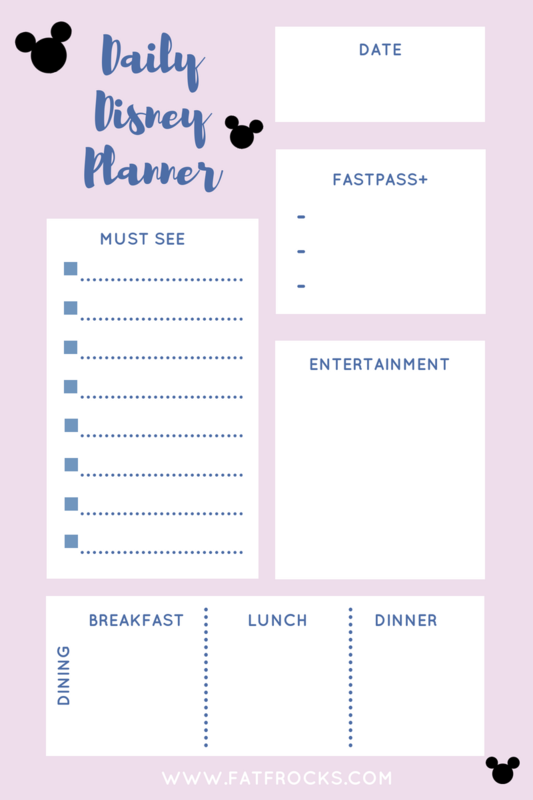 There are some great tools out there to help plan like this spreadsheet and you can find my day planner below. FastPass+ is a digital ticketing system that allows Disney World ticket holders the opportunity to skip the line on three attractions per day. These are completely free and if you are staying at a Disney Resort hotel like we are, you can make your FastPass+ selections up to 60 days prior to check-in for the duration of your stay. I'll be looking to get some passes for the attractions that weren't there on my last visit or in Disneyland Paris so I have a unique experience this time. The attractions at the top of my FastPass+ list are Avatar: Flight of Passage, Expedition Everest, Kilimanjaro Safari, all the mountains (Space, Thunder and Splash), Test Track, Slinky Dog Dash in the new Toy Story Land and the classic Tower of Terror. We have a free Disney Dining Plan as part of our booking, this entitles us to two snacks per day and two counter service meals with a drink of our choice (you can have alcohol, shakes, hot drinks etc). You can upgrade and get table service meals but booking reservations for so many sit down meals would put restrictions on our time and whilst this would be nice it is an extra expense and after looking at the menus for confer service food I know we will be more than happy with the variety. I will make a couple of reservations - I would love to have breakfast at Be Our Guest in the grand ballroom. I also fancy watching the fireworks from our table during a meal in 'Ohana which offers Hawaiian-style grilled food. There are some counter service restaurants which have great reviews so I've made a note of those so I can plan where we eat around the attractions we have a FastPass for and so I don't miss any of those classic snacks like dole whip floats and ice cream cookie sandwiches. 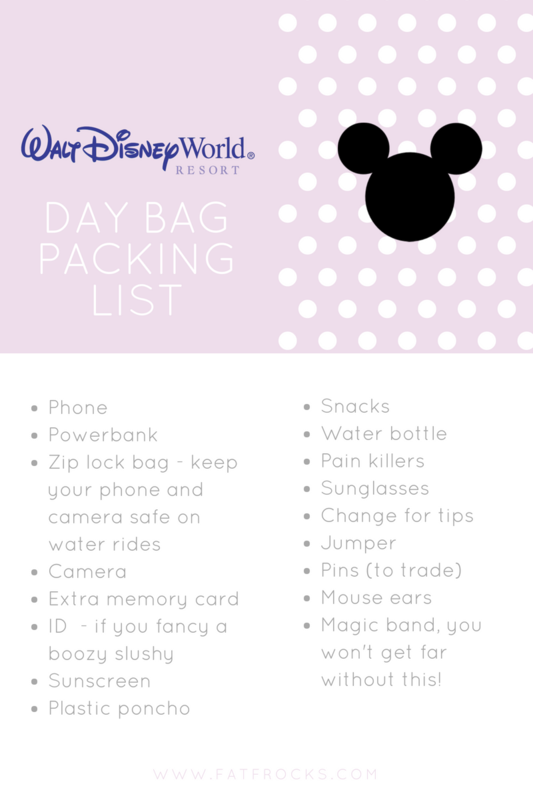 I've shared some tips for packing for Disney on the blog before and a bit of planning ahead can save you money when you're in the park and make the day even more enjoyable so I like to put a together list to make sure I've got everything I need. Who wants to pay $8 for paracetamol or $10 for a poncho if it rains? Not me! I will also make a list for my big suitcase and plan on taking comfy shoes, light layers and some snacks for the hotel room. I will also be packing some cute Disney themed outfits. Yes, I'm 30 but I'm totally ok with being basic. I'm not going full-on Disney princess but I do have this Haunted Mansion t-shirt and fancy getting something with a tropical vibe for my days in Animal Kindom - maybe some dresses with animal or palm print like these ones from the Plus size occasion wear section at Quiz. 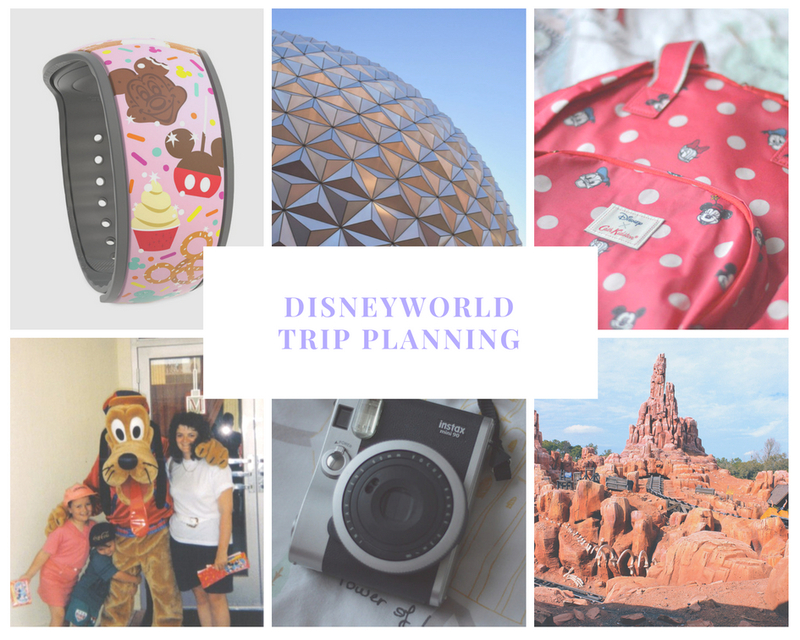 I've already made a big start on planning and the next stages will be making dining reservations 180 days before we go and booking those fast passes 60 days before our trip. If anyone reading this is a Disney veteran and has some tips for me please leave a comment below. I would love to know what your favourite Disney attractions are, any top tips for what see that's underrated and snack recommendations. This is really handy. I really want to go with the kids but need to get the trip all planned out as I like to be well organised. A camera is always on the top of my list. I am dying to go back to Disney World! I went for the first time in 2016 and loved it. You're going to have the best time! This is such a useful planning tool and definitely one that can be repurposed for other holidays in the future! Thank you for sharing and have an amazing time! I love canva, so many free templates there for flyers, twitter graphics and invitations. Free too! Exciting. I think a power pack is important. We love Disney but have only been to Paris. I'd love to go to Disneyworld in the US one day. OH wow, how wonderful! I hope you have an absolutely fantastic time. I'd love to take my kids there one day. The spreadsheet is a great idea, I like it a lot. You should have a fantastic time. Enjoy the trip. So exciting for you, what a wonderful thing to plan. I think it is very wise to have these kind of lists and ideas in mind before you go. There is so much to do and see, you really do need to know. Oh this a great little plan to have. I might use this sort of plan for ever trip with my kid. Have a good trip. I love to make a list in work, for shopping etc so it feels natural for me to do it for my holiday too. I suspect it's good to have a list if you have kids, forgetting a favourite toy would be a big no-no. What a great idea! I loved Disney Land when I went but there is so much to see to do it can get overwhelming.